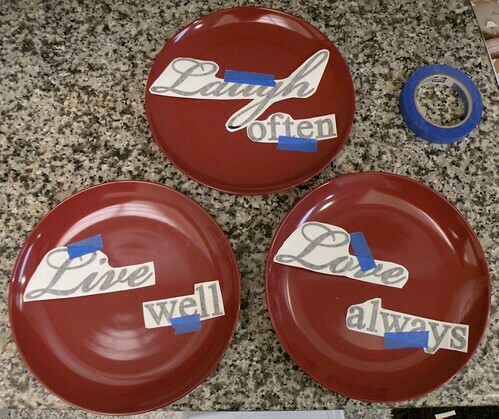 Today I’m going to show you how to make a trio of Inspirational Decorative Plates for only $4. I knew I wanted the vinyl, but wasn’t sure exactly what to do with it. Platters? Maybe a picture frame? Plates? 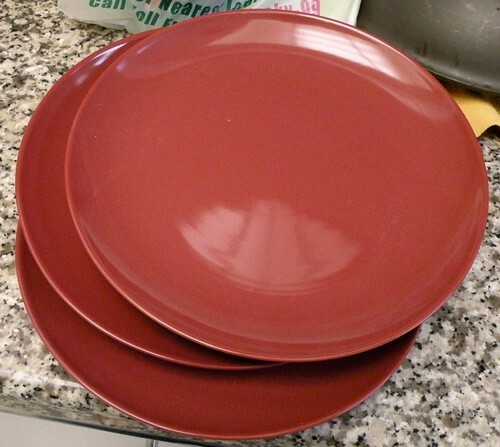 I walked around the store and finally found these red plates. The plates were perfect. They didn’t have a lip inside them, they were large, and they were a nice color. I’ll take them! When I got home I cut apart the vinyl into separate words. It’s so much easier to attach vinyl if you cut it out first so you can make sure it’s centered and square, etc. 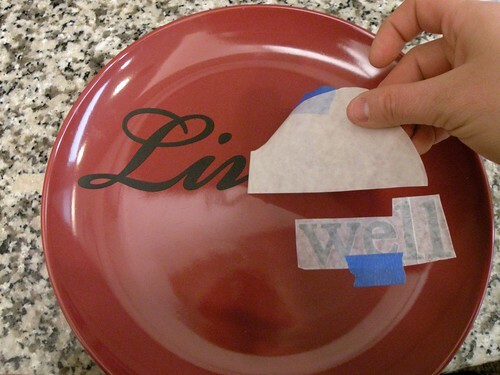 I washed the plates really well and then arranged all my vinyl words on the plates. After that I just attached the vinyl to each plate. So easy! This project took me about 20 minutes (or less) from start to finish. Aren’t they great? I decided to hang them in my kitchen vertically on the wall. I think they would also look great in a plate stand on a shelf or above your kitchen cabinets. 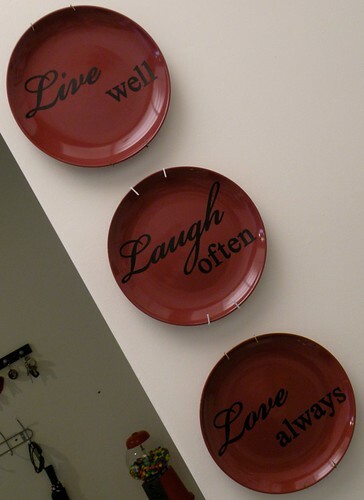 Or you could hang them in a plate rack on the wall or horizontally above a door frame. 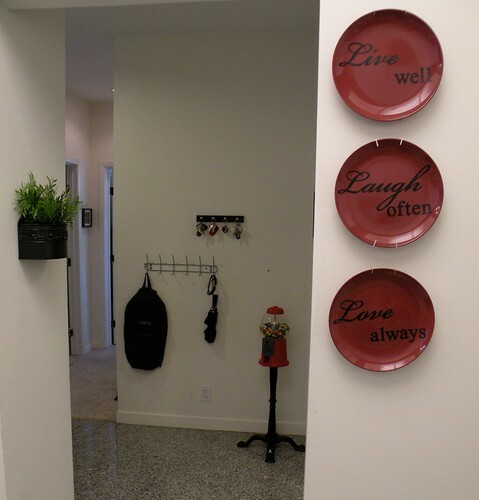 There are countless ways to decorate with these plates. I just love how they turned out. And they look so professional! I still can’t believe they only cost me four dollars. It’s not expensive to have nice home decor. You just have to use a little imagination. 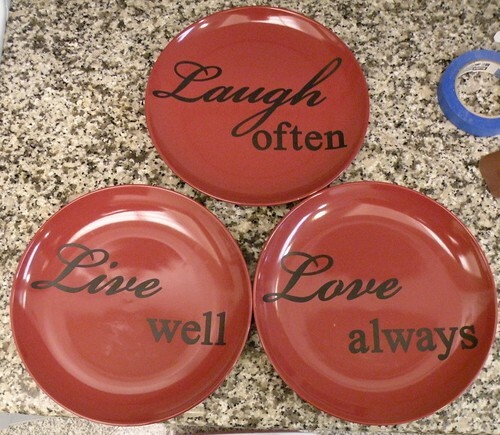 Before I went to the dollar store that day, I had no idea I’d be coming home with a new trio of Inspirational plates. I just try to keep my eye out daily for unique ways to use basic things. Don’t forget to come Hook Up with me each Thursday at my weekly Par-tay! Those look terrific! What a great idea! What a GREAT find! Well done! I love the color of the plates and the sweetness of the words. .99 store? I wonder if we have those in Atlanta? This is such a great idea! How awesome that you found the vinyl at the $.99 store! I should make this an excuse to try out the vinyl with my Cricut. Isn’t it so exciting when you come up with something so great without much money or effort. I just get all excited. I love the plates. Great idea. Very cute! And I can’t believe you found vinyl for only $1! 😀 Love these! You can’t beat a $4 prject, and what a great gift they would make. Very cute!! I love finding vinyl really cheap and think I must do something if I find it!! Thanks for linking up!! Love finding deals. These look amazing. 😆 What a deal on the vinyl words and what you made was very clever – never thought to put it on plates!! Super fun! I can’t believe your dollar store had those decals! I love this. Your plates turned out great.. Very cute Alison! I think they turned out great! Love this, very cool! My kitchen is red and black, so these would be perfect. Good thing I already have a Dollar Store trip planned, I’ll just add these to the list! Wow, I love. Our dollar store doesn’t have the goodies you found! Just my style! Love your blog! VEry cool…what a fast and cute decorating idea! Nice message for a wall. Jane F.
My daughter would love this idea. She has, love, live, laugh all through her house. Those turned out so cute! Can’t believe it only cost you $4! Wow those look great! I love the colors! 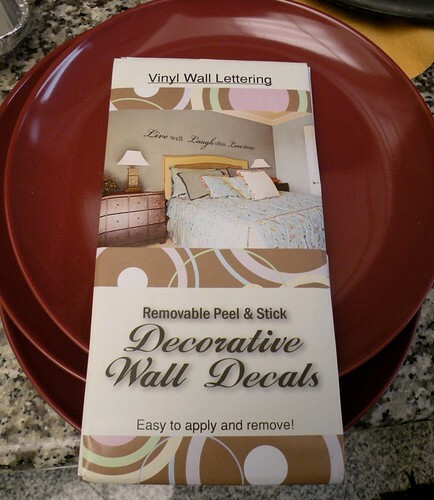 I have some similar decals from the Dollar Tree on the wall in my kitchen, but after seeing this idea, I might pull them off and do this with them! Those look great – I think I need to take a trip to the Dollar Store! I REALLY like these! Love the red! They turned out great- the red gives a nice pop of color! Again, always wanted to try this! Awesome Allison! I will use this idea for above my cabinets in the kitchen. I have been waiting for the perfect thing to do with them!